For Game Boy game released under the international title, see Nemesis (Game Boy). 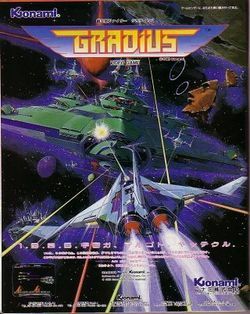 Gradius is a horizontally-scrolling shoot 'em up released by Konami in 1985 for video arcades. It was the first game to be released in the Gradius series. The arcade game was originally released in North America and Europe as Nemesis, although some conversions retained the name Gradius in these regions. Gradius has the distinction of popularizing a weapon selection bar called "Power meter", based upon collecting capsules to 'purchase' additional weapons. Gradius is considered a highly influential game and has set the foundation for many other horizontal shooters for years to come. Konami's arcade game Scramble is often considered a precursor to Gradius. The title Gradius is thought to have been drived from the Latin term for a sword known as a "Gladius". A Gladius was a short sword used in ancient Rome by legionaries. However, the developers went with the name Gradius, and applied the name to the planet that was being attacked by invading aliens. Designer Kengo Nakamura has said in an interview that the chosen name's similarity to Gladius was coincidental. The game was ported to many systems, most notably the NES and PC-Engine (both versions of which have been made available on the Wii Virtual Console) and the Japanese MSX computer. Gradius was so popular in Japan, that the Famicom version was released in the arcade using Nintendo's Vs. arcade hardware as Vs. Gradius. It was rereleased in a compilation package with the sequel Gradius II: Gofer no Yabou in the Gradius Deluxe Pack, a first generation title for the PlayStation and Sega Saturn. It was later collected with many more sequels in the PSP exclusive Gradius Collection. The planet Gradius is under attack from the invading Bacterion Corps. Only one experimental stellar assault weapon is outfitted with enough fire power to take out the Bacterion Corps: The Vic Viper. As the pilot of the Vic Viper, you must pilot it through wave after wave of Bacterion invasion, and reach their leader's base and destroy it, or the citizens of Gradius will be lost. This page was last edited on 20 February 2018, at 16:52. This page has been accessed 43,206 times.